Recorded Live at Mama Kins, Boston, MA, USA - December 19, 1994. Files: 15. :: Size: 174,20 MB. 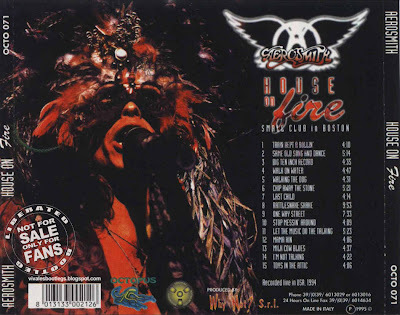 Personnel: Steven Tyler - Lead Vocals, Harmonica, Percussion :: Joe Perry - Guitar, Backing Vocals :: Brad Whitford - Guitar :: Tom Hamilton - Bass :: Joey Kramer - Drums, Percussion . Notes: Excellent stereo from a FM Radio broadcast. 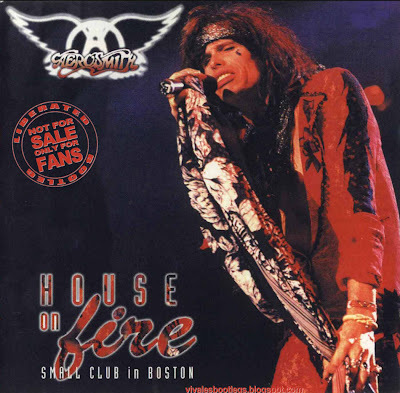 This infamous Aerosmith concert called the end to their 18 month GAG tour. It saw the band going back to their roots playing mainly 1970s material with only a couple of tracks from their recent Geffen days. Rare live performance of "Rattlesnake Shake", "Walk On Water" and "I'm Not Talkin'" The recording is incomplete as missing "Walk This Way" and "Cryin'" (which were before "Mama Kin"). First rate FM recording from the last show of the Get A Grip Tour. This show differs from most other 80's, 90's, and 00's Aeroboots, as it was recorded at Mama Kin Music Hall, which is a small club in Boston. Playing in a small club results in a different sound than playing in large arenas as the band usually does. It's great to hear the band perform in a small club. The boys stuck mainly to their 70's material, which was great to hear. As far as the performance of the band, they put on a great show. Tyler's vocal was excellent, and the rest of the band was excellent as well. This is a top quality bootleg any way you look at it. After hearing so many bootlegs, as I did, there are always a few that you'll remember. This is definitely one of them! Really excellent, the soundquality couldn't be great enough to capture this show. During the long and heavy Get a Grip Tour Steven's voice was often raw, but lucky us not on this one! ... Must have live versions of Walk on Water and Stop Messin' Around (which has completely other lyrics), e.g. "Merry Christmas Baby, you're shakin' my balls off my tree." Steven's asking the audience what song they want to hear, suggesting titles that do not exist. Then he asks if there's a fat lady in the audience, because the show ain't over 'till . There isn't one, so Steven jokes: "Joe, my friend, did you bring your wig, ahah!" Toys in the Attic is played and the stunning show is over... Fortunately, there are bootlegs that ain't over after 'Toys.' Some bootlegs have Cryin' and Mother Popcorn/Walk this Way in addition, which are from the same concert, but are cut out off most recording due to the time available on one CD. <-(Info taken from aerosmithbootlegs.com).